The fourth wall is broken from the start. 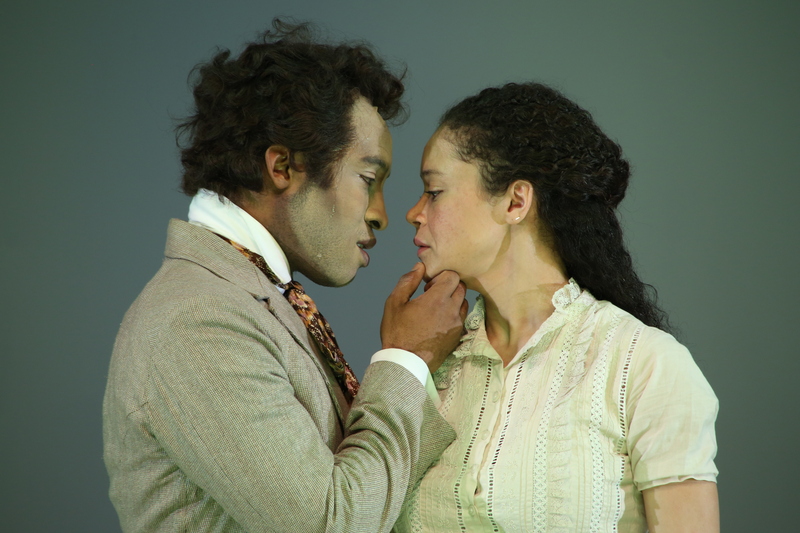 On a blank stage, we meet a black playwright (nimbly played by Austin Smith), who recounts his creative challenges in adapting a work by a white man set in an antebellum plantation with copious, unironic use of the N-word and broad racial stereotypes. Then we meet Boucicault (Haynes Thigpen), the Irish-born actor-playwright-impresario who achieved great fame in mid-19th-century American theater both for hits like The Octoroon but also for successfully lobbying Congress for a copyright law for dramas. (On stage, his brogue-talking avatar also makes a more dubious claim about being a pioneer of matinee performances — which did originate in New York, but several years before Boucicault’s arrival.) Naturally, he objects to the obscurity into which he’s sunk — and the liberties taken by his successor in remounting and altering his play. 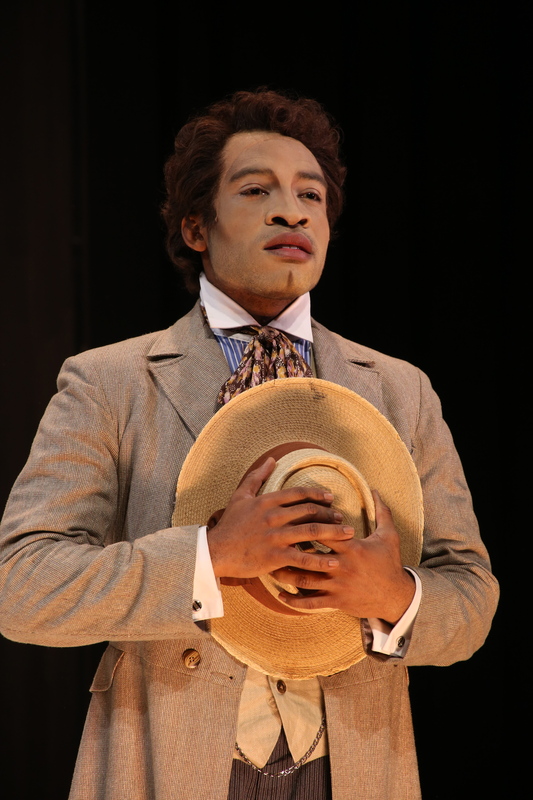 Soon, our modern playwright is applying whiteface to portray the two central white roles, the plantation’s heroic heir, George, as well as his black-hatted and villainous rival, M’Closky, wearing a long black mustache ripe for the twisting. (“Whites don’t want to play racists,” he explains.) 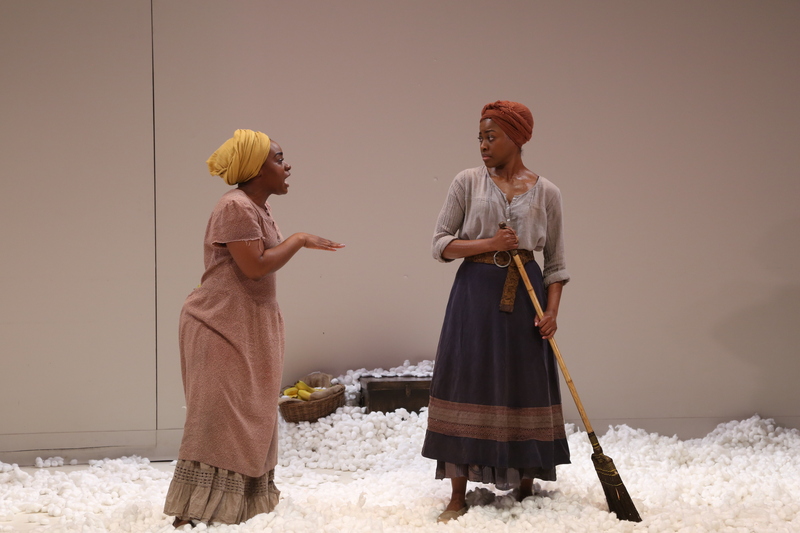 Both of his characters are vying for the title character, Zoe (affectingly played by Amber Gray), the illegitimate daughter of the plantation’s just-deceased owner who’s officially off-limits to our hero because she is one-eighth black. In addition to his other achievements, like using new-fangled innovations like cameras as ripped-from-the-headlines plot twists, Boucicault is credited with coining the term “mash up.” And Jacobs-Jenkins, working with Benson and a remarkable production team, seems to take that phrase as a jumping-off point here. 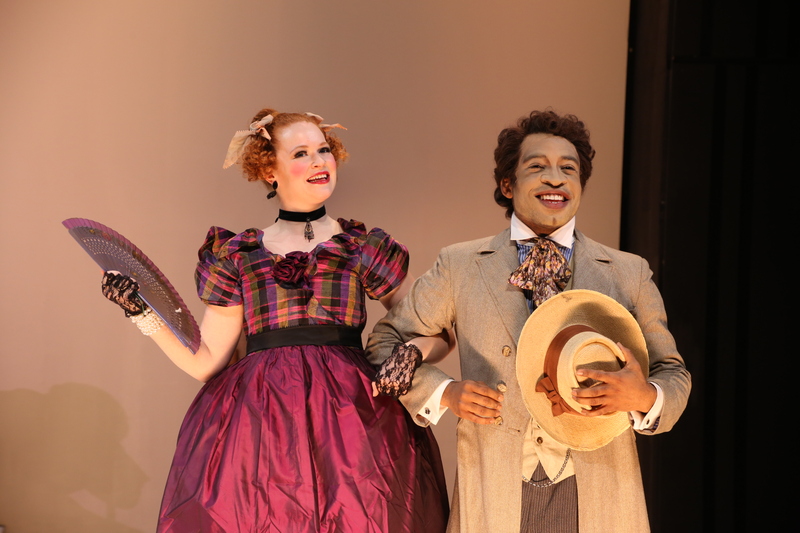 His Octoroon is a blend of performance styles, from slapstick and mustache-twisting melodrama to politically charged minstrelry to a more sincere naturalism, as well as music choices, from hip-hop to an on-stage cellist (Lester St. Louis). The production itself deploys several centuries’ worth of devices, including trap doors, falling scenery, projections, smoke effects, and strobe lighting. In his day, Boucicault was renowned for his stage effects and Jacobs-Jenkins & Co. achieve their own coups de theatre to memorable effect. (I’ll never look at cottonballs in quite the same way again.) And just as Boucicault regularly appeared in his productions, Jacobs-Jenkins makes an unbilled entrance as an uproariously surreal, basket-wielding white rabbit who seems to have wandered in from a Lewis Carroll adaptation.